Berlin, Germany, 1 February 2019. Several hundreds of climate activists from Ende Gelaende, Extinction Rebellion and Fridays for Future are blocking roads and bridges in Berlin today, demanding an immediate coal phase-out. This comes after the German Coal Commission’s report which recommends a phase-out by 2038. With this path, Germany would clearly miss the 1.5°C target set by the Paris Agreement. “This plan is a disaster for the planet. With such little ambition, there is no hope left to reach the 1.5 degree target. Instead of really becoming the country of the Energiewende, we keep being the world champion of lignite mining. The German coal lobby gets billions of money for nothing. Future generations and people in the Global South will have to pay for this”, says Nike Mahlhaus. The Coal Commission’s report only states it would be “desirable” to protect the ancient Hambach Forest, due to be cleared this coming October to make way for a the expansion of a lignite mine. This has been a central demand from environmentalists and climate justice groups, with 50,000 people protesting for a quick coal exit to protect the forest last October. The report also gives no guarantee for the villages threatened to be destroyed for lignite mining. “We did not expect much from this commission, but now we are outraged! The commission suggests that we sacrifice a liveable future for all to protect the economic interests of a few. People in the villages threatened by lignite mining are left in limbo. Hambach forest is not safe yet So, our struggle will go on. Our resistance will rise strongly – united as a global movement for climate justice”, says Kathrin Henneberger, a further spokesperson of Ende Gelände. Climate activists from all over Germany have announced a week of protests in cities all over Germany, including Cologne, Hamburg, Munich, Leipzig, Bonn, Kassel, Bielefeld and Essen. 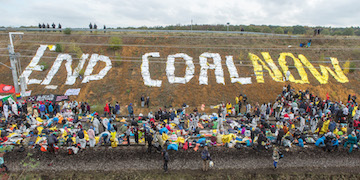 Ende Gelände is an alliance for global climate justice, using actions of civil disobedience to call for the immediate coal phase-out in Germany.